This Stainless Steel Gravy Boat features a mirror finish, tapered spout and stylish contoured handle. If finding simple yet elegant ways to accentuate your customers' experiences is important to your restaurant. Sure, gravy could be easily ladled onto customers' plates in the kitchen, but utilizing a gravy boat can add a touch of class to the establishment, making the experience all the more memorable for the customer. 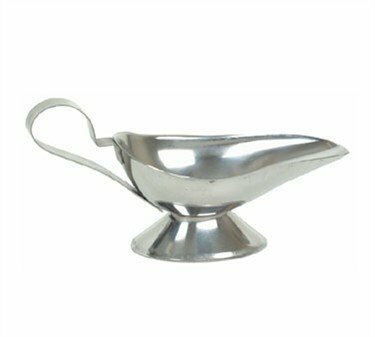 This gravy boat can be used for other sauces as well and would be a great addition to any restaurant. Thunder Group has a solution in this classic gravy boat.